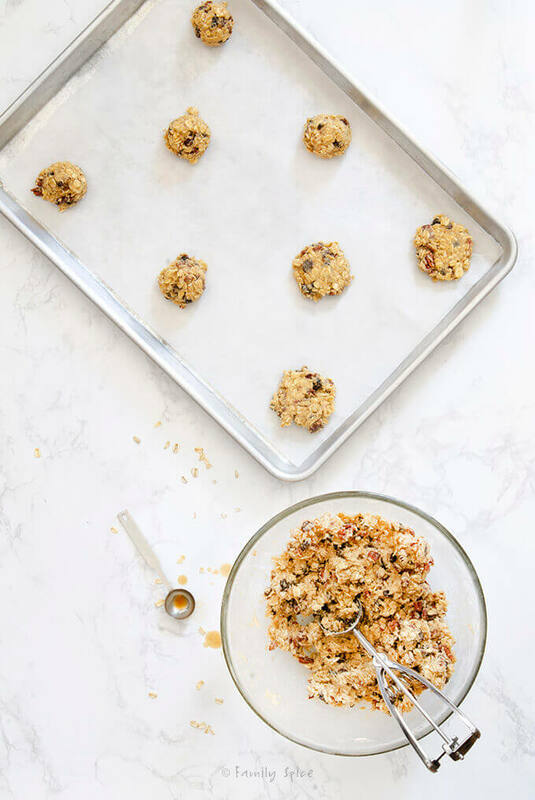 In my quest to find the perfect oatmeal raisin cookie, this recipe for Ina Garten Oatmeal Cookies with Raisin and Pecans are not too moist, not too crunchy, but just right! Oatmeal Raisin Cookies are my husband’s absolute favorite cookie. And, if you haven’t figured out yet, he’s very particular about his cookie. Remember, he’s an engineer. “It has to be moist and it can’t fall apart.” Oh the pressure to find the perfect recipe! My daughter has also fallen in love with oatmeal raisin cookies. I figure, oatmeal, raisins… it’s a breakfast cookie! Makes perfect sense to me. So I began to hunt for the perfect oatmeal raisin cookie recipe. Luckily, Ina Garten came to the rescue! Can you use quick oats for cookies? One of the first experiments I made for my quest for the perfect oatmeal raisin cookie, was to try different types of oatmeal. 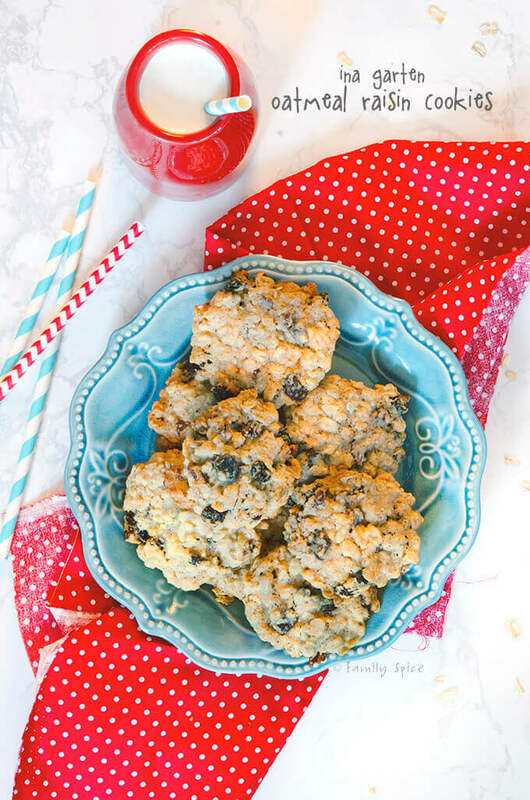 The biggest question came to whether you should use rolled oats or quick oats for the best cookie. Is there a noticeable difference in the baked cookie? 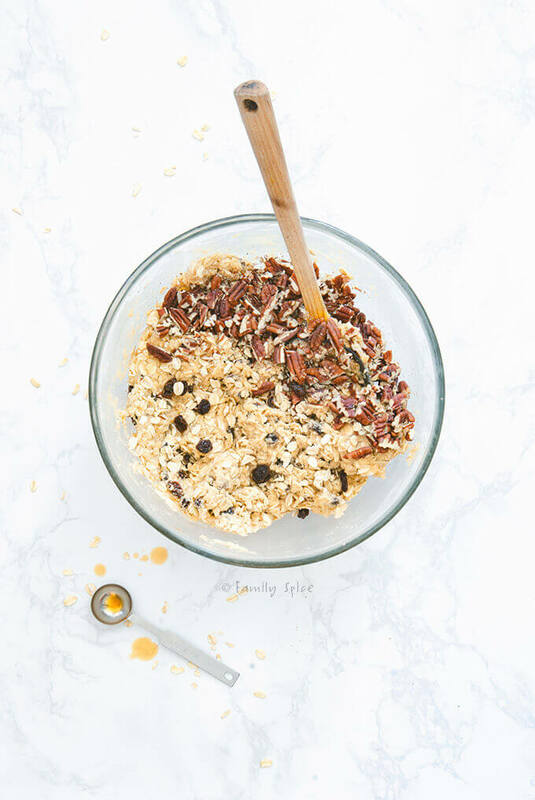 Quick oats are more processed than old fashioned rolled oats. Whole rolled oats are oats that are steamed and then flattened. Quick oats are pre-cooked, dried, and then rolled and pressed. The are a bit thinner than rolled oats and cook much faster than the rolled oat variety. Traditionally, rolled oats are used to make oatmeal raisin cookies. 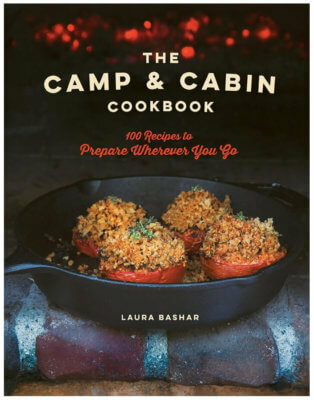 And Ina Garten’s oatmeal cookie recipe is no different. The butter based cookie is made with old fashioned rolled oats that give the cookie a chewy texture. You can see the bits of oats in the cookie, giving it a more rustic look. 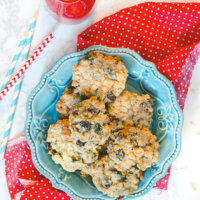 You CAN use quick oats for oatmeal raisin cookies, the taste is basically the same. But you will end up with a more uniform looking cookie, and slightly less chewy quality than if you use rolled oats. So you see, the difference is personal preference. Can you use steel cut oats for cookies? Steel cut oats are processed by chopping the whole oat into smaller pieces instead of being rolled. Steel cut oats are higher in fiber and generally more nutritious than rolled oats. But, they also have a different texture and take longer time to cook than it’s other varieties. 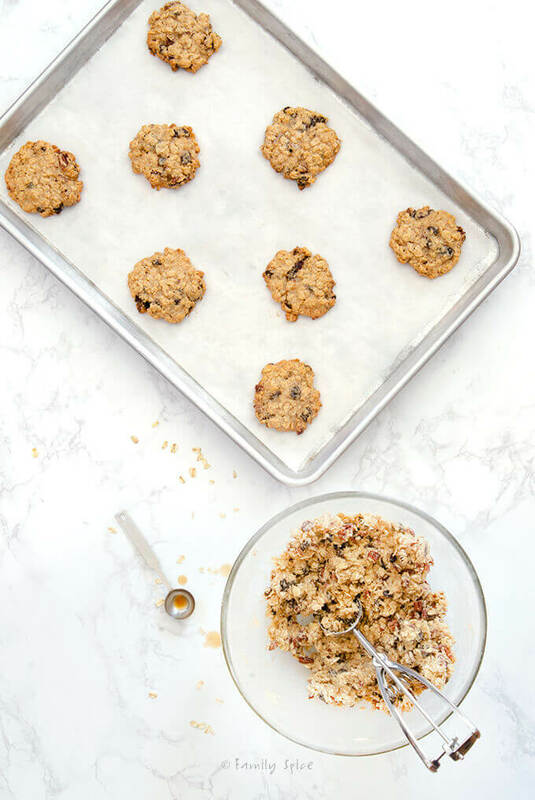 You can use steel cut oats for cookies, but you can’t substitute the oats in this recipe and expect the recipe to turn out the same. Steel cut oats require more liquid and a longer cooking time to cook. 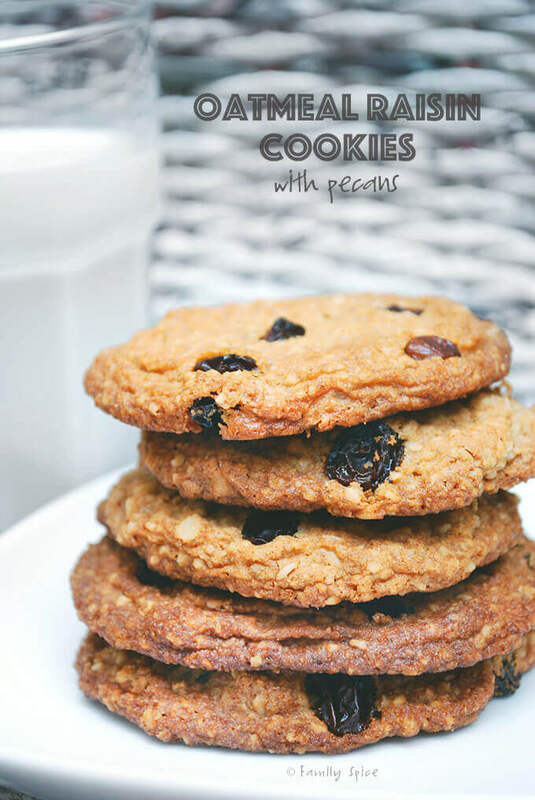 Although I have not tried making oatmeal raisin cookies with steel cut oats as I have with rolled and quick oats, you can try this recipe from Quaker Oats for a steel cut oatmeal raisin cookies. The fat used in Ina Garten Oatmeal Raisin Cookie recipe is butter. My usual inclination is to swap out the butter for olive oil. But, I decided this time, to follow Ina’s recipe to the letter. I have made these cookies several times, and I’m happy to say that it has never failed me. The only substitutions I have made in this recipe is to use walnuts when I am out of pecans. I find that these two nuts are interchangeable in baked goods like cookies and muffins. You could also use any other dried fruit like cranberries or cherries, but then again, it wouldn’t be an oatmeal raisin cookie, would it? I have always fought the urge to use a scooper for my cookie dough batter, but I have to say, I love the way I can use equal amounts of batter every time. 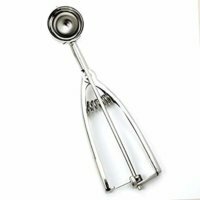 This mini ice cream scoops come in different sizes and really make the cookie making process go faster. 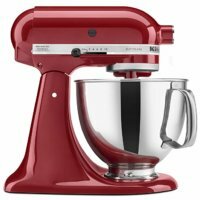 Do you need to use a scooper to bake even looking cookies? No, not at all. For many years I used my trusty tablespoon and would scoop the dough out with that and chisel it out with a smaller spoon or knife. But the scoop certainly makes the process go smoother, even if you are scooping out rustic oatmeal raisin cookies. Just scoop out the batter onto a baking sheet and press it down with your damp hand or the bottom of a glass to flatten. Final thoughts about Ina Garten oatmeal raisin cookies. I loved the batter, nutty and oaty. Yes, I know, you shouldn’t eat raw cookie dough. But I was impatient and took a little bit. I also snuck a bite of a cookie while it was cooling on the cooling rack, too. I love the touch of cinnamon and nutmeg in the cookies. They really add something special to all the flavors. Personally, I’ve never met a chocolate chip cookie that I can resist. That’s my personal favorite cookie. But Ina Garten oatmeal raisin cookies are certainly a close second! And the rest of my family agrees. My boys who would never eat oatmeal raisin cookies before, couldn’t resist a few cookies every time they walked into the kitchen. Homemade cookies really are the best! Place the pecans on a baking sheet and bake for 5 minutes until crisp. Set aside to cool. Chop pecans coarsely and reserve. Mix eggs in one at a time, then mix in vanilla extract. In a separate bowl whisk together flour, baking powder, cinnamon and salt. Add dry ingredients into wet and mix until fully incorporated. 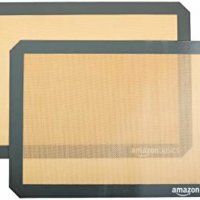 Using a tablespoon, drop 2-inch mounds of dough onto a baking sheet lined with parchment paper or silicone baking mat. Flatten slightly with a damp hand. Bake for 12 to 15 minutes, until lightly browned. Let cookies rest in the baking sheet for one minute, then using a spatula transfer to a cooling rack to cool completely. Serving Suggestions: Great with walnuts, dried cranberries, or any other dried fruit & nut combination! Ok ok I think I have to make these for my husband for Valentine’s Day! 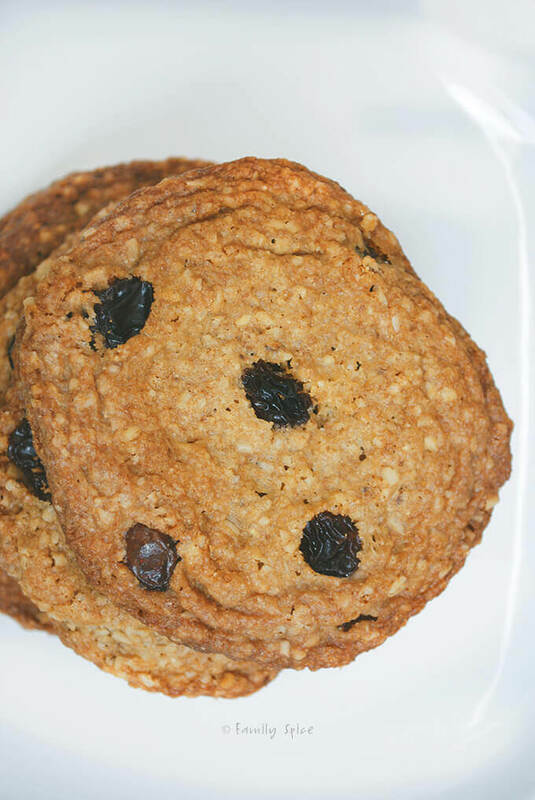 If he’s an oatmeal raisin cookie fan, then he’ll definitely love them!